Keep barreling or not? 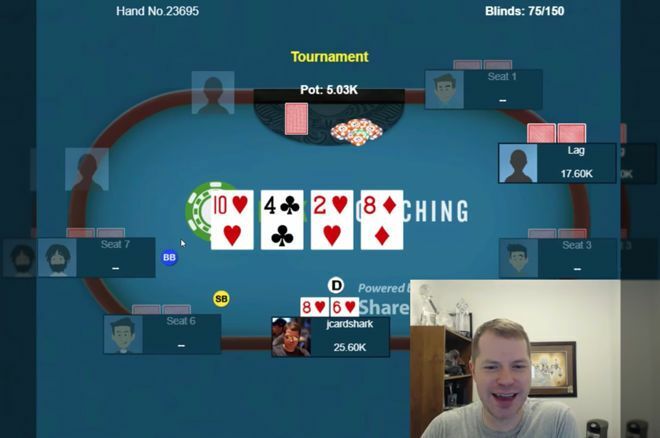 Decide how you would play @JonathanLittle's junky draw and marginal made hand.
.@JonathanLittle analyzes a tournament hand in which his suited connectors provide him a junky draw. This week's hand comes from a $2,000 buy-in no-limit hold'em tournament with a small field. The blinds were 75/150 and the effective stacks around 20,000, which means we were quite deep. A loose-aggressive player opened for 400 from middle position, and I looked down at on the button. As I discuss in the video below, with this speculative hand I could go in any direction — folding, calling, or reraising — the decision often affected by the playing styles of the original raiser and those in the blinds. In this case I chose to reraise to 1,300 with my small suited connectors. It folded back to the middle position player who called, then he checked after the flop fell . My opponent called to bring the pot up to about 5,000, and when the turn brought the my opponent checked again. Having made a pair, I had to decide whether to keep betting as I intended or instead to check. I'll stop there and let you see what happened next, as well as hear the reasoning behind how I chose to proceed with my junky draw and marginal made hand. In this hand, picking up that pair on the turn gave me potential showdown value, which encouraged me to check that street rather than bet again with my draw (as I had planned to do). In general, when you have lots of nut hands in your range and relatively few potential bluffs, you should be willing to continue firing. If you chicken out and rarely bluff, you are definitely leaving money on the table.